This safari brings out the explorer in all of us! This safari kicks off with game drives and launch cruises in Queen Elizabeth National viewing some of the 611 recorded species found in QENP. We then head for Kyambura Gorge for a thrilling Chimpanzee tracking safari with an evening launch cruise on the Kazinga Channel. The safari makes the journey towards Murchison Falls for more big game viewing followed by a launch cruise on the River Nile. No reviews yet for this trip. Browse other reviews below for Budget Safaris Uganda . Depart early morning for western Uganda. The park is set in the western rift valley and runs from the foothills of Mountain Rwenzori to the Ishasha border post in the south. The Park has a vast bird diversity of 611 recorded species, of which there are bothendemic and migrant Albertine species. The ride is comfortable with a stop over at the Mpambire drum makers, coffee plantation and the equator. You may go through Lake Mburo National Park at an extra cost (request for it). Proceed to Mbarara for lunch. After lunch drive westwards to Queen Elizabeth National Park, driving past large tea and banana plantations. The drive takes you through some craters along the road and the unique western rift valley escarpment. There are chances of viewing rare animals and birds. The park boasts of a variety of big game like; lions, buffaloes, kobs, elephants, bushbucks, and the rare occasional leopard. Dinner and over night stay at Bush Lodge / Wildtrack overland camp / Ecology Institute Hostel/ Simba Safari Camp. After lunch, take on a launch cruise on the Kazinga Channel – one that joins Lakes Edward and George. The cruise is a wonderful way to see hippo, buffalo, kob and occasional Nile crocodile (which up until recently did not inhabit this area) and a spectacular bird watching on the water bank. Retire to your accommodation for dinner and over night. Rise very early for a morning game drive to catch-up with the early risers and predators returning to their hideouts. You will be likely to meet grazing hippos, elephants, lions, spotted hyenas and leopards, bushbuck, water buck.After lunch drive through the crater areas for scenery and more game viewing as you proceed to Fort Portal. Dinner and overnight stay at Kibale forest Camp / chimp’s Nest / Chimpanzee Guesthouse. After breakfast, drive to Murchison Falls National Park with picnic lunch enroute. Arrive at Park. Stay at Red Chilli Camp / Murchison River Lodge or cross by ferry to Fort Murchison / Bwana Tembo on the northern bank of River Nile for dinner and overnight. Start the day with an early morning game drive on any of Buligi, Albert or Queens Tracks north of the river Nile. Look out for those animals that are unique to the African Savannah like giraffe, antelope, lion, elephant, and the Uganda kob. After lunch, you will take on a launch cruise along the Nile River. 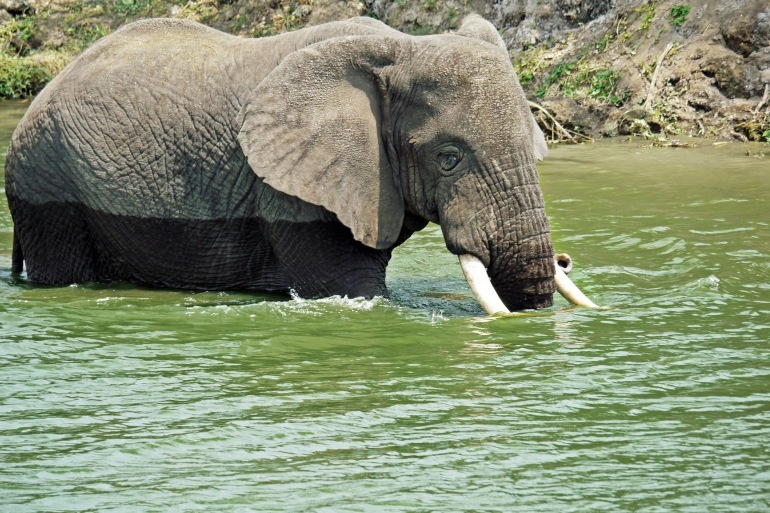 The cruise takes you to the Bottom of the thundering falls where you will see huge crocodiles, schools of hippos, buffaloes, elephants and a variety of water birds like herons, cormorants, ducks, bee-eaters, kingfishers, skimmers, fish eagle and the rare shoebill. Return to the lodge for dinner and overnight. On this day before you leave the park, you take a drive to the “Top of the falls” for a breathtaking sight of the raging Nile as it forces its way through a rocky gap barely six meters wide.